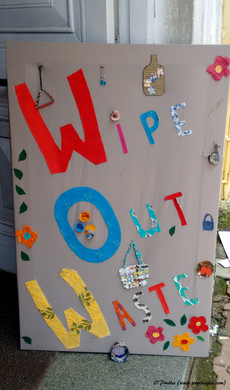 ‘WOW!’ is your first reaction when you set your eyes on the ingenuity of the enterprising ladies who came together to have this exhibition called Wipe Out Waste in September 2015. It was an eye opener to the myriad ways in which people could utilise the waste around the house and turn it into a thing of beauty just by using a bit of creativity. Kamakshi Shenoy from Alto Betim has a media background having worked for Herald and Big FM. 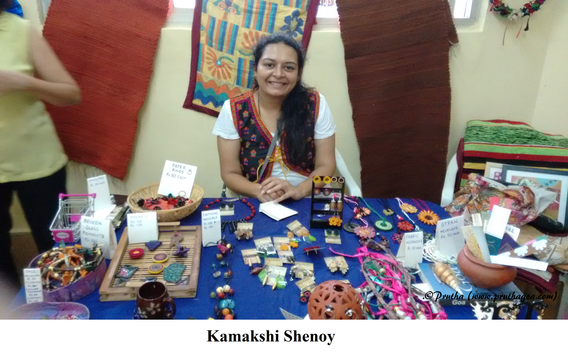 Moving away from a career in journalism, she decided to turn her hobby into an occupation, supplying about six shops with her innovative jewellery made from waste. WOW is her second exhibition as a participant. Her array of jewellery consisted of necklaces made of old earbud headphones and cut up ballpoint pen refills, paper coasters and jewellery items made of ice cream cartons, an Aqua Guard pipe, spiral coils (used in spiral binding) and shirt collars. She has even used the glass of her broken wall clock to make decorative pendants. Mountain Dew and Sprite PET bottles have been used to obtain material for attractive yellow and green coloured earrings. Lucia D’Souza’s display was a pleasant surprise that showed off barrette holders in the form of rag doll heads with braids on which hair clips and clothes pegs could be kept together; and bottles and plates decorated using decoupage, an art form where paper is glued on a surface and varnish is applied over it. Marie-Lou Pinheiro Alemao had inventive and spacious bags made from discarded denim jeans and black bottles with a piece of chalk as a stopper…a handy message board in the kitchen. The oldest participant at the exhibition, Cibele Noronha, crocheted with plarn (short for plastic yarn), which is yarn made from plastic bags. Chatty and full of verve, she explained how she had managed to learn how to make beaded necklaces made simply of paper and glue. Her table display included bottle cap coasters and baskets and lampshades made from old cards. Small coin purses, cosy slip-ons and hot water bottle covers knitted from leftover wool made up Nirlep Mathur’s presentation. ‘I got into this through my niece Abhinandita,’ said the soft spoken Nirlep who is part of the enterprise Aunty Crafts at Caranzalem, started by her niece. Emy Fernandes and Olinda Santos had a table of upcycled articles to themselves, consisting of pouches for toiletries and mobile phones, pencil holders, pin cushions, rolled paper baskets, stocking butterflies, hair clips and painted bottles. Emy spoke about her work saying, ‘I’ve had exhibitions abroad. I do bottle painting, wedding flowers and a whole range of handicrafts and I teach it too. I love working with kids because they are more spontaneous and receptive.’ Emy has had a workshop for school children and is ardent about encouraging youngsters to take up this creative hobby of turning waste into something useful and pleasing to the eye, and consequently quell to some extent the serious garbage problem that Goa has to grapple with. She continues, ‘We’ve got good feedback for this exhibition. 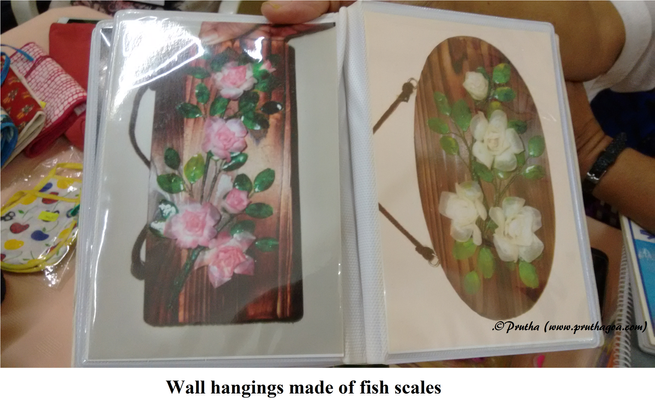 People are surprised so much can be done from waste.’ The highlight of her handiwork is wall hangings made from fish scales, which requires the tedious process of procuring the scales, curing, dying and so on before obtaining the end product. Aira Mirchandani is one of the founders of NAM, or Naree Artisans Movement, is an organisation that aims to preserve and bring back into modern industry the beautiful art of needlework. Natasha da Costa Fernandes and Milan Khanolkar are the other two founder members of NAM that brought all these creative women together to produce WOW. ‘We have worked with the Goa State Museum photographing and documenting old quilts, which are a minimum of forty years old,’ says Aira of her two year old organisation. She advocates workshops in schools that will teach sewing skills to young people who have become a ‘throw away’ generation with no consideration for the overflowing landfills. ‘Shortly, I don’t know what we are going to do. I don’t know what it takes for people to realise that,’ says Aira. It is the affluent and the educated who have largely contributed to this issue instead of remedying it. WOW was in a small but concrete way an eye opener to the public as to how waste can be upcycled. If the message reaches the younger generation, we could still rein in this gargantuan garbage problem. Participants at WOW included: Shaili Dar and Savitri Subramaniam of Tara Trust, Olinda Santos, Emy Fernandes, Nirlep Mathur, Kiran, Cibele Noronha, Marie-Lou Alemao, Jean Fernandes, Lucia D'souza, Kamakshi Shenoy, Milan Khanolkar, Natasha da Costa Fernandes and Aira Mirchandani.